The rationale for these series of articles is not only to help the business builder and manager avoid stepping on landmines that knowledge from the area of neuroscience and psychology could help them step around, but also in a more proactive fashion to share information that could enhance performance – particularly in the pressure cooker, battlefield (pick your metaphor!) that is business. In other words, smack dab at the confluence of performance and neuroscience/psychology where you find our Business Brain Model. 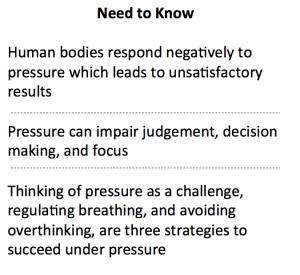 The inspiration (and much of the content) for this article came from: “Performing Under Pressure: The Science of Doing Your Best When It Matters Most” by Hendrie Weisinger and J. P. Pawliw-Fry. These gentlemen are respectively a psychologist and a performance coach, which illustrates the scope of the issue and the depth of insights. Amongst other things that make this book so relevant is it draws on studies involving over 10,000 people from the pinnacle (top 10%) of sports, business and military careers and combines it with some meaningful research related to biology of the brain. The additional appeal to me here is that they propose a systematic approach and they are quick to explode the myths that have built up around this topic. They open with the premise that pressure and stress are not the same thing. In their model, pressure reflects the bigger challenge that comes when something critical is on the line. Presumably, (from an evolutionary point of view the analogy would be survival) today for the average business-person that translates to success. Pressure can impair your judgment, decision-making and focus and therefore affect performance in every professional and personal arena. In other words, if we mistake stress for pressure we then overreact and this exacerbates performance. Despite the scholarly tone of their book this still strikes me as a subjective call – important but subjective. 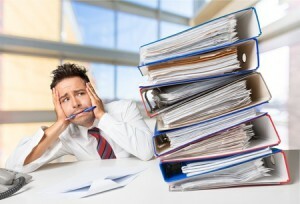 One of the generalities that I find increasingly relevant and informative is – nobody does better under pressure.The irony is that when you need to perform at your very best (the authors would argue that you can’t do better than this despite the myths associated) you respond negatively to pressure and you do much less. They sum it up thusly: “The best you can do is your best.”Bottom line – pressure makes us worse! Another salient point reflects how working memory (in the article “It is past time to slaughter your sacred cow” I go deep into brain capacity and fatigue) is clouded when it is inundated with the (emotional) by-products of overreaction. Of the twenty-two that they propose I have chosen about 1/3 to share in this article. By way of full disclosure I have chosen ideas that reflect principles I have proposed in prior articles – such as sensory experience (“Are you creating environments designed to enhance relationships?”) and Zen like breathing (“The feel and sound of your passion aroused”). Having said that – here are the ones I recommend. I had to include this one since ‘going first’ (e.g. when pitching) is a heuristic I have proposed in several articles (especially in “Business vs. Science: are you losing this fight?”) from the point of view of the brain of the recipient. In this context the concern is how your brain becomes your worst enemy. Their work in this area can be described as mental preparation for pressure. While I believe these words are largely self-explanatory – the authors provide lots of context and useful ideas. Lest there be any doubt of the relevance of the content of this book – the authors cite the work of Lakshmi Balachandra (“The predictors of who actually gets the money are all about how you present yourself” from “What Negotiators Can Learn from Improv Comedy”) who found that characteristics including calmness, passion, eye contact and lack of awkwardness were better predictors in pitches to venture capitalists than context! Another tidbit, originating from researchers Jennifer Butler and Roy Baumeister of Florida State University (from, “The Trouble with Friendly Faces: Skilled Performance with a Supportive Audience,” published in the Journal of Personality and Social Psychology), focuses on the counterproductive aspect of performing (pitching) in a ‘supportive’ environment: the explanation seems to be increased self-consciousness. As we often refer to in these articles – the origins are evolutionary in nature – failure to perform could get you exiled which is most counterproductive when it comes to survival. And without survival we are only left with extinction.